Why choose function over form or form over function when you can have both? The best freestanding bathtubs look great and can provide you with hours of luxurious relaxation, in the comfort of your home. Take a look at some of the top stand alone tubs available today. The best freestanding tubs on the market have a lot in common. Although it’s possible to find bathtubs made from metals or other materials, each of the freestanding tubs we looked at was made from acrylic. Acrylic has its benefits and drawbacks. On the benefits side, it’s lightweight, durable and retains heat. On the drawbacks side, it can scratch easily. One other thing worth noting when you’re in the market for a freestanding tub is that you’re pretty much guaranteed to have to buy the tub filler separately. All of the tubs we reviewed included overflows and drains, but none came with fillers or faucets. Finally, it’s worth looking at how much the tub can hold. The smallest tub we reviewed holds just 52 gallons of water, while the biggest, the AKDY, has a capacity of 79 gallons. The Empava Freestanding bathtub is made in the US of a glossy acrylic. It has a modern shape and a versatile design that is meant to work with a variety of decors. 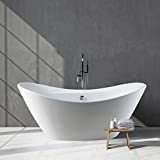 The acrylic material used in the tub makes it a more budget-friendly option compared to tubs made from steel or cast iron. Additionally, acrylic is lightweight, so you don’t have to worry about reinforcing your bathroom floors when you install this tub. Because of the flexible style of the tub, you can position the tub filler wherever you would like. It can go at the top of the tub, or you can position the filler somewhere in the middle. People who have tried out the Empava bathtub are for the most part happy with their purchase. One issue that a few pointed noted was that the drain seems to leak. In some cases, the leaking drain was caused by user error, but in others, the drain issue seems to come from the tub itself. Tub measures 26 inches deep and 67 inches long, ideal for soaking. It can hold up to 58 gallons of water. The bathtub includes a pop-up drain and overflow. Some people have reported issues with the drain leaking. Some have noted that it’s difficult to install. The Woodbridge freestanding bathtub has a lot in common with the Empava tub. Both are 67 inches in length, both have a contemporary design, and both are made from acrylic. The acrylic used on the Woodbridge bathtub might be a little more high-end than the acrylic used on the Empava, though. It is reinforced with fiberglass and resin and has an internal MDF layer for additional reinforcement. The double-walled design of the tub means that it provides more insulation, so that the water stays warm, even during the longest of soaks. The freestanding tub has a flexible design so that you can place the tub filler at a variety of locations. Although it is freestanding, some people have used it in place of a standard alcove tub, tucking the bathtub into a recessed area of their bathroom. People’s impressions of the tub have been mainly positive. Many have noted how lightweight the tub is, which makes it easy to maneuver and to install. Those who had concerns about the tub noted that the drain didn’t sit quite right, making it difficult for all of the water to drain away. Large size and depth are ideal for soaking. Reinforced acrylic is durable and retains warmth. There’s the possibility of issues with the tub’s drain. Some have noted that the overflow and drain were chrome, not the brushed nickel advertised. The FerdY bathtub is slightly longer than the Empava and Woodbridge models and just a bit narrower. It can be a good pick for people with smaller bathrooms who still want to enjoy a freestanding tub. Like the other models in our roundup, the FerdY is made of acrylic, which means it is somewhat lightweight (it weighs just over 90 pounds) and durable. Although the tub itself is slightly longer than other models, the volume of water it can hold is somewhat less than other models. The tub has a capacity of 51.9 gallons. The shape of the tub might also leave some people wanting more. It’s a modern design and style, but the shape of it makes it look like a smile, so some people might not find that appealing. Overall, people who’ve tried out the FerdY tub have been happy with it. Some noted that it was a snap to install and that it is easy to clean and keep clean. 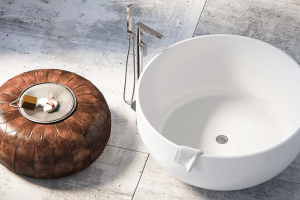 One critique people had about the tub had to do with its shape and size. 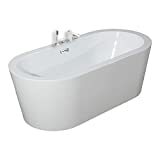 Since the tub has very tapered sides, it can be difficult for people to stretch out and relax while in it. 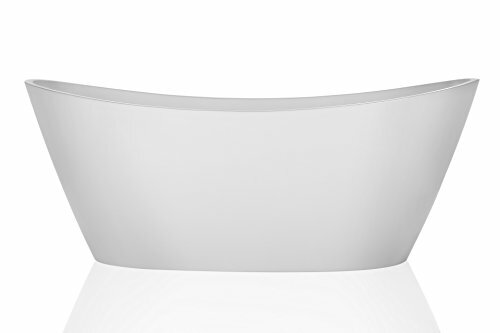 Tapered sides make the tub less comfortable. Holds less water compared to similar models. The AKDY bathtub has the honor of being the tub in our roundup that holds the most significant amount of water — more than 70 gallons. It’s wider and deeper than the other models we looked at, although it’s slightly shorter in length. The tub is made from acrylic, but is a little heavier than other models, as it weighs over 100 pounds. Even with the slightly heavier weight, it’s unlikely that you’ll need to reinforce the floor of your bathroom to use the AKDY tub. People who’ve purchased and used the AKDY bathtub seem happy with it for the most part. 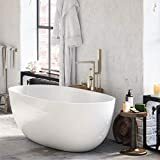 It seems that professional installation is the way to go with this tub, as many people noted that their plumber or contractor made slight tweaks to the tub to improve it. The one complaint that some people did have concerned the drain. A few noted that it leaks slowly so that the water level falls while you’re taking a bath. Holds a lot of water — 79 gallons. Can be difficult to stretch out and relax in. The MAYKKE bathtub might the most simplistic, minimalist design out of the tubs we’ve looked at, but sometimes, simple is best. 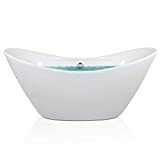 It essentially looks like a large basin or bowl, without tapered sides or any additional bells and whistles. If minimalism is your thing, this might be the tub for you. Measuring 61 inches in length and 30 inches across, the tub is on the small side. It holds just over 52 gallons of water. Like the other tubs in our roundup, the MAYKKE includes a drain and overflow. It also comes with a flexible drain pipe, just in case the location of your bathroom’s plumbing doesn’t line up with where you’d like to position the tub. People who tried out the tub were happy with its looks and its cost. The one complaint a few people had concerned the drain — they noted that it leaked. Includes drain and overflow, as well as a drain pipe. 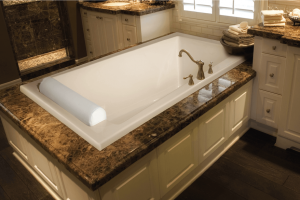 Why should you choose a freestanding tub over a different style of tub? It helps to understand how a freestanding bathtub is different from other styles. As you might get from the name, a freestanding tub stands on its own. You can climb into the bathtub from any of its sides. Since a freestanding tub isn’t surrounded by walls, it needs to be finished on all sides. Some styles are encased in a deck made from wood or stone, but most stand on their own. A classic style of freestanding tub is the claw foot tub. 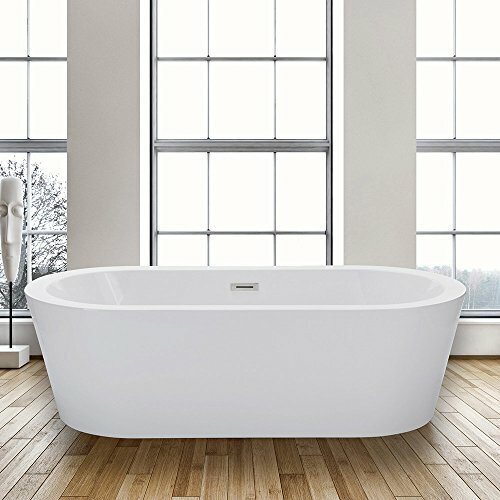 Other freestanding bathtubs have a wide flat base and rest directly on the floor of the bathroom. Standard or Alcove Tubs. A standard bathtub also called an alcove tub, is surrounded on three sides by a wall. It’s the smallest and usually the least expensive type of tub. Drop-in Tubs. A drop-in tub rests upon a deck, or box, usually made from wood or stone. It can stand in the middle of the bathroom or rest against a wall. Corner Tubs. Bigger than alcove tubs and usually pricier, corner bathtubs jut up against the corner of a bathroom. They are finished on two sides. Perhaps the biggest benefit of a freestanding tub is its good looks. 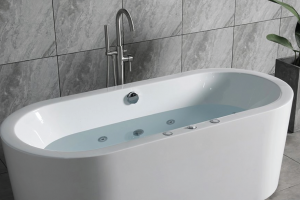 Most of the best freestanding tubs are designed to be attractive. Since freestanding tubs are often the center of attention in a bathroom, they need to look good. Another benefit of a freestanding tub is that it’s usually bigger than a standard bathtub and is designed for long, relaxing baths. It can be difficult for an average-sized person to squeeze into an alcove tub, that’s not the case with a freestanding bathtub. Of course, even the best freestanding tubs aren’t perfect. Here’s are a few of the disadvantages of installing a freestanding model in your bathroom. The tubs have a large footprint. Not every bathroom can accommodate a freestanding tub because of its size. The tubs tend to weigh a lot. Freestanding tubs are often made from enamel coated metal and can weigh a ton. They can be pricey. 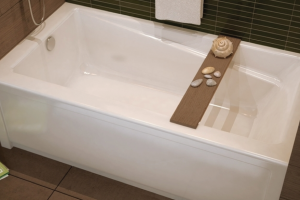 Compared to your typical alcove bathtub, freestanding models typically have a higher price tag. Material. 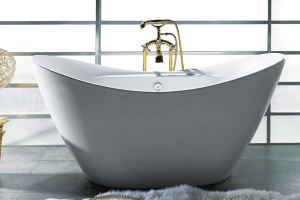 Tubs come in a variety of materials, from lightweight plastic and acrylic to heavier cast iron or enamel coated steel. Enamel coated metal tubs have their benefits, mainly that they are pretty durable and look attractive. But they also tend to weigh a lot more than plastic and can chip easily. Plastic or acrylic tubs tend to be more wallet-friendly but can scratch easily. Style. Freestanding tubs come in a range of styles. You might find that you want a classic, vintage looking tub with claw feet. 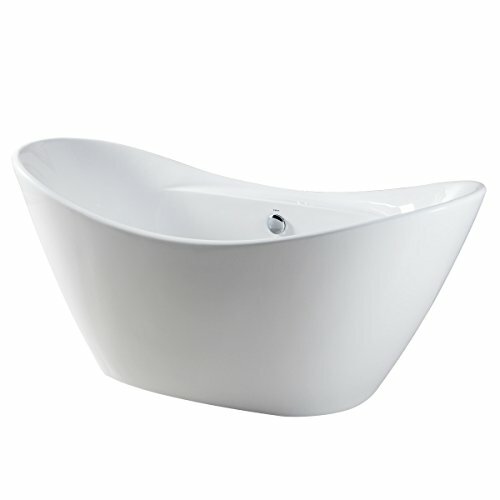 Or, you might find that you want sleek, modern-looking tub. Size. Tub size refers not only to the dimensions of the bathtub but also to how much water it can hold. 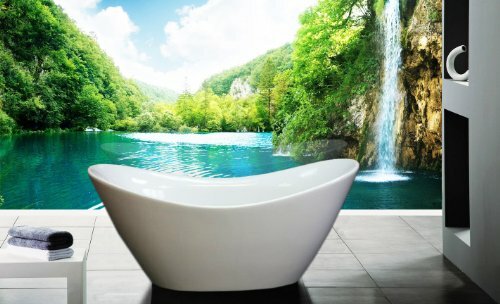 You can choose a tub that you can relax in with ease. If it’s a tight squeeze, you’re not going to enjoy your bath very much. How much water the tub can hold is also something to consider. For example, you don’t want to choose a tub that has a capacity that’s bigger than the volume of your water heater. If you choose a tub that holds more water than your water heater tank can provide at a time, you might find yourself taking cold baths. So, which of the best freestanding tubs would we crown as the winner? We pick the Empava 67″ Luxury Freestanding Acrylic Soaking SPA Tub. The Empava tub has a lot going for it. It’s neither too large nor too small, and it’s made of flexible and durable acrylic. The tub does seem to have drain issues but almost seems to be a universal problem with stand alone tubs. For best results, we recommend working with a contractor or plumbing when installing the best freestanding bathtubs in your bathroom.